Long haired cats sometimes need to have their hair cut or mats removed. 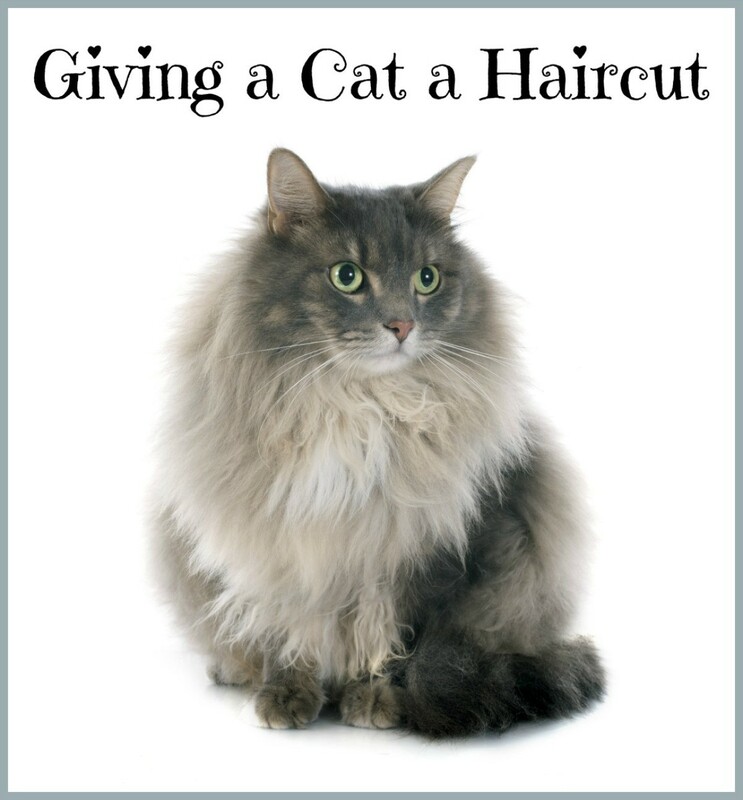 This is a guide about giving a cat a haircut. My cat's very long hair has become matted over the past couple of months. Since it's so hot here in Texas now, I wanted to give her an overall short haircut to clean her up and keep her cooled off. I have some electric clippers with various size combs on them, but I can't come near her with those. She's terrified of the noise and vibration. Any ideas? Thank you. I'm a cat groomer, and wouldn't suggest trying to groom your kitty with clippers on your own unless your cat is very laid-back and calm around them. Cats aren't as easy-going about being groomed as dogs are, so it's best to take them to a professional groomer for a haircut. Also, their skin is a lot thinner than dogs, and it's very easy to cut the skin with clippers or shears (and never use scissors on your cat... even the professional groomers won't do that that... dangerous). However, if you want to get the mats out yourself, the cheapest and safest way is to rub lots of corn starch (like you can get in the bakery aisle of the grocery store) on the mats and let them sit for 15 minutes or so. Then they will be much easier to comb out. Corn starch dries out the moisture that keeps the mat together. Sometimes a the mat will come right off and leave a bald spot, but if you use enough corn starch and let it sit, it shouldn't be at all painful for your cat. Still, if the cat is really very badly matted, this may not work for all the knots and it's better to talk to a groomer. Good luck! shower with my husband scared him pretty good.!!! We had an orange persian cat when I was young, and we lived in the PNW. Slugs were rampant, and the cat was both indoor/outdoor. He got a couple of slugs in his fur, and he just wouldn't let my parents near him with anything to help. We wound up taking him to the groomer, and that poor cat was shaved except for his head, paws and tail. He looked hideous. Lesson learned: Leave the matted fur to professionals, don't want to hurt the cat. then when the fur started to grow back, we sat him on our laps and first petted him with our hands. With more growth, soft cat grooming brushes. By the time his fur was grown back, he would sit and let us groom him no problem. He also learned to stay indoors when it rained. DO NOT USE SCISSORS TO CUT A CATS HAIR! This is especially dangerous to try when cutting out mats. Sometimes mats can be extremely close to the skin. I used to work as a vet tech and saw this happen more than once. An owner, meaning well, tried to cut the mat out with scissors and cut right through the cat's skin and it literally leaves a huge open hole in the skin. A cat's skin is extremely delicate- like tissue paper. For mats your best bet is to take to a professional groomer who has experience with cats and who is fast and have them clipped. I have a Himalayan and I do this once or twice a year-in fact he goes tomorrow. He gets clipped and bathed and the whole process takes maybe 20 minutes...our groomer is very fast and very gentle. She cuts his hair as short as possible-not for the look, but because it is safest for the cat to use the shortest blade (the space between the teeth is the smallest and less chance of the blades "biting" and tearing the skin). It's a very delicate process...do your homework! I also would not try to pull a mat out...I imagine that would be quite painful-you are ripping the fur out of their skin. Since it's my cat's first haircut I wanted to know if her hair will still be soft afterwards. She's 1 year old and I wanna take her to get groomed or trimmed because she sheds everywhere. My daughter cuts her cat's hair once every year and it always grows back thick and soft. But I would advise to do that only at the beginning of summer. Leave the cats hair long during the winter months as it is needed to keep the cat warm.